As of January 29, 2019. Short Project Description Construction/installation of fiber-reinforced pavement or interlocking concrete blocks along top of levee to provide vehicular access during weather conditions that may otherwise restrict road access to and from critical LID facilities. Additional Technical Information During Hurricane Harvey, several roads were inundated and impassable to vehicular traffic. This circumstance restricted the LID operator’s ability to access critical facilities, including the Steep Bank Creek pump station. In order to access the pump station, the LID operator had to drive on the top of the levee during the event. Extensive vehicular use of the levee during extreme rain events can cause rutting and other damage to the levee. By hardening the top of the levee, which is at a significantly higher elevation than the roads within LID 19, the LID operator can have improved access to critical facilities without the risk of potential damage to the integrity of the levee. The LID Board, with the advice of its engineer and operator, is evaluating whether to use fiber-reinforced pavement or interlocking concrete blocks, or a combination thereof, for this project. At this time, the initial phases of the Project will use fiber-reinforced concrete. Estimated Total Project Cost (including engineering and contingency) $1,920,000 – covers approximately 26,000 linear feet of levee top. Estimated Schedule Initial phase of Project is intended to prioritize hardening of levee surface in the area immediately adjacent to the Steep Bank Creek pump station. Construction of the initial phase of the Project is anticipated to be complete by April 2019. Later phases of the Project are to be determined by the Board, subject to receipt of bond proceeds. Project Status Contract for initial phase of Project has been awarded. Continuing evaluation of levee surfacing materials for future phases of Project. Financing Source Project will be funded through LID 19 Bonds with a plan of financing that is not projected to increase current LID 19 tax rates. Additional Technical Information Studies are underway to determine the additional flood remediation needed to protect all residential structures in the district from flooding. Estimated Schedule TBD based on solution, funding and complexity. Project Status Data and modeling are underway to understand the parameters involved in flood protection for all residential structures. We expect this to be completed in 3Q2019. Additional Technical Information Many residents expressed confusion during Hurricane Harvey when information related to projected water levels of the Brazos River was communicated. Residents requested clarification with respect to structural flooding risk from and their own finish floor (slab) elevation. The National Weather Service (NWS) maintains and monitors Brazos River levels through a series of gauges along the river. The closest river gauge to LID 19 is located at the NWS’s river gauge at Richmond. However, because the gauge at Richmond is further upstream from LID 19, the mean sea level elevation at the gauge location is different from the mean sea level elevation at LID 19. Therefore, water surface elevation readings at the Richmond gauge are not equivalent to elevations in LID 19.
Financing Source Project has been funded from LID 19’s current cash on hand (general operating fund). Short Project Description Expansion of permanent pumping capacity at Steep Bank Creek Pump Station to meet Fort Bend County Drainage District criteria, taking into consideration new rainfall data released in 2018 by NOAA. Temporary Trailer Mounted Pumps and Sheds for the pumps have been purchased and are on site. 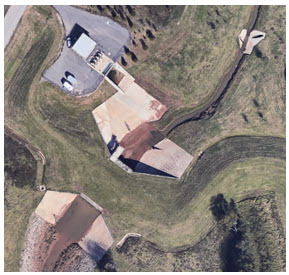 As the primary sight for the removal of water from the Steep Bank Creek Watershed, the Steep Bank Creek Pump Station is the cornerstone of our district’s storm water management system. Following Hurricane Harvey, an independent engineering review suggested that the pump station should be expanded to meet the current regulatory requirements prior to Hurricane Harvey and to meet the revised requirements including updated rainfall and river data. Note that this isn’t a “Harvey Proof” action but providing more capacity does move us in the right direction. The recommendation based on pre-Harvey data was to increase the pumping capacity by at least 40,000 gallons per minute (GPM). The current pump station has four 20,000 GPM pumps. In addition, 12 6,000 GPM temporary trailer mounted pumps have been added, along with lighting for the pumps. These pumps double our fixed capacity but are not considered best practice for operations. Several methods of expansion being evaluated, including are adding two additional 20,000 GPM pumps and replacing the current pumps with four 35,000 GPM pumps, as well as alternate solutions such as adding two 100,000 GPM pumps. Factors the board will be considering is the cost to retrofit, the impact to the operational status during expansion, future expandability to name a few. When it comes to cost, the more capacity the more the expense is a good rule of thumb, but we will be weighing the financial cost against the protection provided and making an informed decision. Every method of maintaining maximum operability during the expansion project will be utilized. From planning when the project starts to temporary systems being on sight and tested prior to removal of any permanent equipment from service. Future expandability may mean a quicker regional solution to “Harvey Proofing” the district but would without a doubt force LID19 and LID15 to shoulder a greater financial portion since the initial cost of expandability would fall on only those residents. Want a deeper understanding? Click here. Project Status Engineering has been selected; preliminary design phase. Financing Source Project will be funded through LID 19 Bonds. The Board intends to pursue a plan of financing that is projected to not increase current LID 19 tax rates, but additional information (expected to be considered after preliminary engineering results) is needed. To better understand what that increase does for our ability to handle water, let’s look at a few facts/numbers. First, it is important to understand that our watershed in total is approximately 2,854 acres of which we directly control 758. But make no mistake rainfall on the entire 2,854 acres ultimately exits our watershed at the outfall where the Steep Bank Creek Pump Station is located. Next let’s talk rainfall. One inch of rain on one acre results in approximately 27000 gallons of water. Some rough math tells us that an inch of rain throughout the entire watershed will result in approximately 74,250,000 gallons that needs to be managed in one day for one inch of rain. Dividing that by 24 hours in a day and again by 60 minutes in an hour results in a needed capacity of approximately 52,000 GPM. 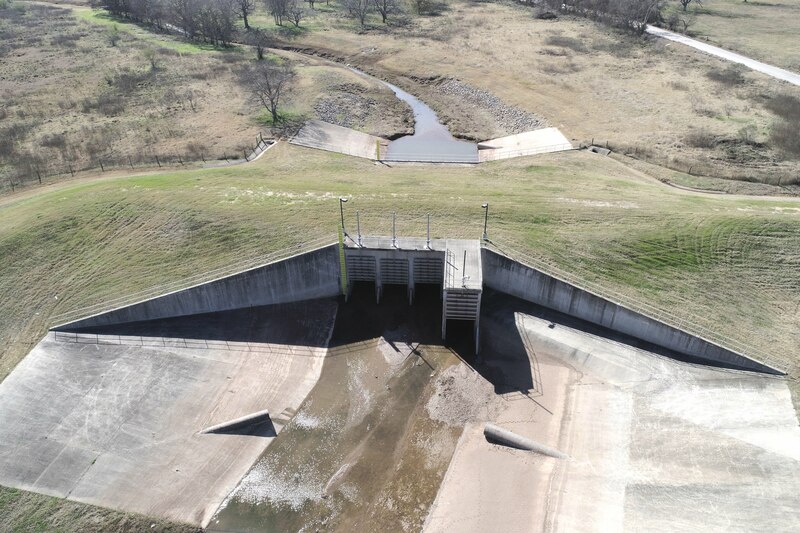 Knowing this, when the Brazos River causes gravity outfall to close, an additional 20,000 GPM of pumping capacity increases the maximum pumping abilities from 1.5 inches per day to 2.3 inches per day. An additional 35,000 GPM of pumping capacity increases our maximum pumping abilities to 2.69 inches per day. You may be reading this and thinking, that doesn’t seem like a lot of rain before we are maxed out. Well, that is where detention plays a role. Detention is used to hold large amounts of water and to release that water slowly into the Steep Bank System which allows a smaller pumping station to handle the large volume of water without being overwhelmed. It simply means the pumps will be pumping long after the rainfall stops as the detention ponds slowly drain. 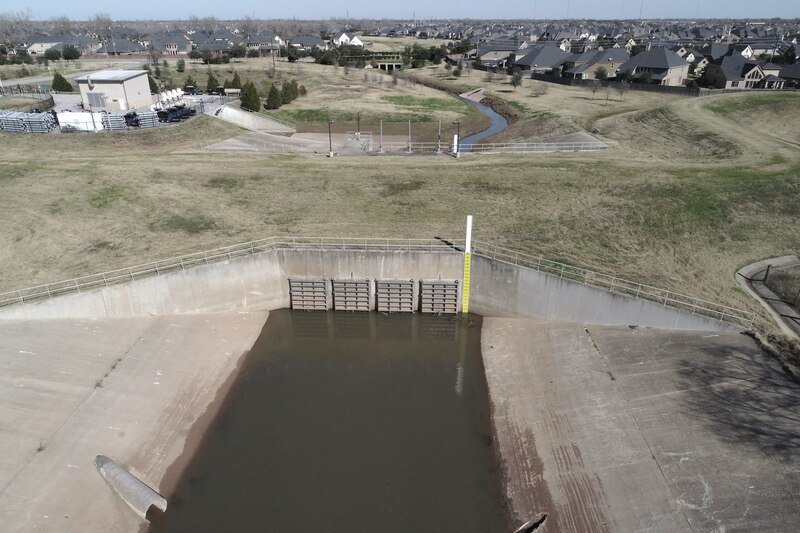 Our watershed’s detention ponds add approximately 6 inches of rainfall capacity to our system in a given day. This means that for a given 24 hour period, if the Brazos River is at a level that we are not able to gravity outfall, our capacity will still be to handle a more than 8 inches of rainfall on the watershed. One wrinkle to this overall capacity which the board continues to evaluate is what happens during an extended event where the detention ponds are all full over the course of extended, intense rainfall. In other words, a multi-day event like Hurricane Harvey. Well, the simple thing is that once the detention areas are all “used up”, we must calculate the needed capacity as though not only there is no detention available but add the slow release rate of the detention to the overall rainfall requirements. This would mean that to “Harvey proof” (assume a max 24 hour rainfall of 10 inches) the watershed we would need a capability to remove in excess of 520,000 GPM. That’s approximately 400,000 GPM than the expanded Steep Bank Station. With this in mind, our board continues to research and develop additional solutions. As of January 3, 2019. Short Project Description Construction/installation of four permanent emergency notification monument signs at critical locations within LID 19. Additional Technical Information Although LID 19 has a website and emergency messaging options, not all residents within the District are aware of the LID’s website or registered to receive notifications. During emergencies, especially during events requiring evacuation of the area, prompt messaging to the community is critical. The LID Board has agreed to four (4) permanent LED signs within LID 19 to provide emergency notices to residents. The signs are planned to match the aesthetic quality of existing neighborhood monument signs and will be permanently anchored in place to avoid any risks during high wind events. All signs are being planned to include backup power in the event of power outages, and messaging can be programmed onsite and offsite. The LID Board has planned the installation of the first emergency notification sign at the southern entrance of the District at LJ Parkway. The first sign is planned as a double-sided, color LED panel with surrounding masonry. The locations and specifications of the three additional signs will be determined after evaluation of the first sign. Estimated Schedule Construction of the first sign is anticipated to be complete by March 2019. The remaining three (3) signs can be constructed within 6 – 9 months of final recommendation by the Board. Project Status Contract for sitework for construction of first sign has been awarded. The Board will consider the installation of the remaining three (3) signs upon completion and evaluation of the first sign, and subject to receipt of bond proceeds. Financing Source Project will be funded through LID 19 Bonds with a plan of financing that is projected not to increase current LID 19 tax rates. Short Project Description Construction and installation of a 42-inch diameter stormwater line along University Boulevard with a valve that can be opened under certain emergency conditions to transfer excess stormwater between the Steep Bank Creek watershed and the Alcorn Bayou watershed. Additional Technical Information A watershed is an area where all rainfall falling within the boundaries of this area drains to a particular stream/ditch/river. For example, the Steep Bank Creek watershed is defined by all rain water that falls and drains to Steep Bank Creek (SBC) which then eventually flows to the Brazos River under gravity conditions. When the levee gates are closed due to high river levels, storm water runoff from this watershed needs to be pumped out of the levee system to the river by the SBC pump station. A similar description can be applied to the Alcorn Bayou watershed. These two watersheds are hydraulically independent, isolated by the natural topography of the terrain within Riverstone and the underground storm sewer system that serves each watershed. This means water from one watershed does not have a natural path to the other during a rain or flood event. During extreme rainfall events where street flooding is occurring throughout the community, the watershed boundaries can become blurred. 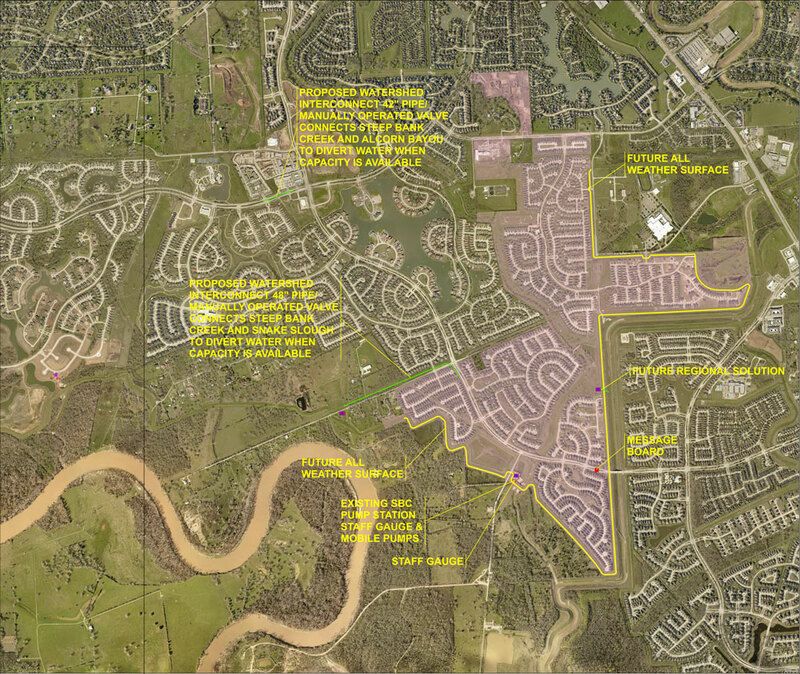 The proposed Watershed Interconnect Project connects the Steep Bank Creek watershed to the Alcorn Bayou watershed with a 42” diameter underground storm sewer line. This pipe will have a valve that is normally kept closed. This pipe can provide additional drainage capability to either watershed in the event that one system has surplus capacity to accept or pump out water. It also provides redundancy to the Alcorn Bayou pump station and the Steep Bank Creek pump station, should an unforeseen event cripple one of these two pumping facilities. This interconnect is designed to have a capacity to move up to about 39,000 gallons per minute of water from one watershed to the other. The storm sewer located along University Boulevard and the benefit of the connection of the two watersheds is shared equally by FBCLID 19 and FBC LID 15 as it provides equal benefit to the associated pump stations and watersheds. Estimated Schedule Construction will take approximately 6 months to complete once started. Project Status Engineering design is nearing completion for City/County review and approval. The project is currently on hold pending receipt of Bond proceeds and additional evaluation by the Boards of FBCLID 15 and FBCLID 19.
Financing Source Project will be funded through LID 19 Bonds with a plan of financing that is projected to not increase current LID 19 tax rates. Short Project Description Construction and installation of a 48-inch diameter stormwater line along Hagerson Road with a valve that can be opened under certain emergency conditions to transfer excess stormwater between the Steep Bank Creek watershed and the Snake Slough watershed. Additional Technical Information A watershed is an area where all rainfall falling within the boundaries of this area drains to a particular stream/ditch/river. For example, the Steep Bank Creek watershed is defined by all rain water that falls and drains to Steep Bank Creek (SBC) which then eventually flows to the Brazos River under gravity conditions. When the levee gates are closed due to high river levels, storm water runoff from this watershed needs to be pumped out of the levee system to the river by the SBC pump station. A similar description can be applied to the Snake Slough watershed. These two watersheds are hydraulically independent, isolated by the natural topography of the terrain within Riverstone and the underground storm sewer system that serves each watershed. This means water from one watershed does not have a natural path to the other during a rain or flood event. During extreme rainfall events where street flooding is occurring throughout the community, the watershed boundaries can become blurred. The proposed Watershed Interconnect Project connects the Steep Bank Creek watershed to the Snake Slough watershed with a 48” diameter underground storm sewer line. This pipe will have a valve that is normally kept closed. This pipe can provide additional drainage capability to either watershed in the event that one system has surplus capacity to accept or pump out water. It also provides redundancy to the Snake Slough pump station and the Steep Bank Creek pump station, should an unforeseen event cripple one of these two pumping facilities. This interconnect is designed to have a capacity to move about 30,000 gallons per minute of water from one watershed to the other. Estimated Schedule Construction will take approximately 6 months to complete once started and should be complete before the start of the 2019 hurricane season. Project Status Engineering design is complete, and the project is currently being advertised for competitive bids.